I recently heard a pundit say that there's more violence in America's living rooms than on America's streets. That may or may not be true, but what I do know is that it can be easier to talk about peace in the Middle East than it is to address making peace in our own families. I'm fortunate that I come from a loving and intact family, yet we still have our differences. Like many families in the 21st century, mine spans several different religions and a wide range of political views. Plus, we have plain old individual quirks that can drive each other nuts from time to time. There's nothing like the holidays to bring all of that into the forefront. It wasn't until I was in my 30s that I discovered a powerful weapon for keeping the family peace: Intention. Rather than approaching the kitchen table with trepidation, just waiting for the first jab or disagreement, I realized that I could approach my family with the intention of bringing peace. I could stop focusing on who loved and accepted me and who didn't. I could resolve to simply love and accept every person at the table just for their quirky beautiful selves. I could stop waiting for love and resolve to be the Lover. That lesson was solidified for me when my father was sick with cancer and was driving us nuts recounting the same stories over and over again. I realized that even though it was irritating to hear the same words again and again, a time was fast approaching when I wouldn't be able to hear his voice at all. So I learned to say, "Yes, daddy, I love that story. Please tell it again." And then I would listen to that voice I had known since childhood, its tone and timbre, and try to memorize its song. I still miss his voice at Christmas these 10 years later. I go now to the family table, bringing food and a few small gifts and especially bringing my intention to love. May we be happy. May we feel joy. May we be at peace. And may you, my online friends, be happy. May you feel joy. May you be at peace. Today I printed a new block in red, outlining the location of the West Bank Separation Barrier in the region of Qalqiliya. In 2002 the State of Israel adopted the plan to build a security wall along and within the West Bank. Supporters of the wall maintain that the barrier is essential in preventing terrorists and suicide bombers from entering Israel. In fact, since the erection of the Separation Barrier, the number of attacks has declined by more than 90%. Thus, the fence seems to be doing its intended job. Opponents of the barrier object that the route substantially deviates from the Green Line (see previous post) into the "occupied territories" captured by Israel in the Six-Day War of 1967. They see the barrier as an attempt to annex Palestinian land under the guise of security. Others object on humanitarian grounds, noting that the wall restricts Palestinians' ability to travel freely within the West Bank and to access work in Israel, isolating them in non-contiguous walled ghettos closely controlled by Israel. Qalqiliya, the area I've chosen to depict here, has been cut off on three sides by the wall. The single entrance to the town is an Israeli checkpoint which the 40,000 inhabitants must pass through whenever they come or go. In a 2004 advisory opinion, the International Court of Justice found that "the construction of the wall, and its associated régime, are contrary to international law." There are other opponents, mostly Israeli settlers in the West Bank, who object to the wall because it appears to renounce the Jewish claim to the whole of the Land of Israel, including the entire West Bank. Daily life, Halevi told me, felt like a crossroads between apocalypse on the one side and collective transcendence on the other. And he described a constant debate inside the mind and soul of most Israelis, not just between his country's "right" and "left." We struggle with our responsibility for the suffering of Palestinian society, he confessed. And at the same time, he insisted, we feel ourselves engaged in a life and death struggle to survive in a volatile Middle East that has declared war on us since before we were a state. In Jews, he said, whether secular or devout, this awakens a tension between competing biblical, ancestral commandments: to remember that your ancestors were slaves in Egypt and to care for the poor and the weak in your time; and on the other hand, to remember how the Amalekites attacked Israel after it crossed the Red Sea, when it finally felt safe, and never to let that happen again. My next step in the print is to begin adding some "players" to this "stage." Last week I finished carving the Islamic pattern for the Palestinian territories and also the "Green Line." The Green Line, so called because green ink was used when it was first marked on a map, refers to the lines of demarcation that were agreed upon in the 1949 Armistice between Israel and its neighbors after the 1948 Arab-Israeli War. The Green Line is not a definitive and legal international border, but in practice it defines those areas which are administered by the State of Israel and those which are administered by the Israeli military or the Palestinian National Authority. The area I've focused on in this print is a portion of the West Bank where Israeli settlement incursions have penetrated deeply into lands east of the Green Line. Because these settlements consume land where a Palestinian state could emerge, they have made it extremely difficult for a two-state peace solution between Israel and Palestine to be achieved. The settlements also antagonize Israel's Arab neighbors and erode some of the support Israel receives from United States. But perhaps most importantly, some argue that the settlements are a real threat to Israel's democracy because they set up an untenable situation where Jews who live east of the Green Line in the West Bank are voting citizens of Israel while Palestinians living in the same land are not. Human Rights Watch has just published a report examining these separate and unequal policies in the West Bank. I love the powerful, fierce expression of refusal in this poem by Suheir Hammad, who appeared at the TED Women conference in Washington DC on December 8, 2010. Hamad is a Palestinian-American poet, author and political activist. She was born in Amman, Jordan to Palestinian refugee parents and immigrated with her family to Brooklyn, New York City when she was five years old. I'm carving again. This time I'm working on a pattern that will overlay the tan-colored areas of the print, the "Palestinian territories" on my map. I like using patterns to show cultural ties to land. I first did it on the Locusts In Babylon print and then I used patterns again on Vast Unpeopled Lands. I searched online for an Islamic pattern to use and this one stopped me in my tracks when I saw that it includes a 6-pointed star. The inclusion of the star speaks to the ancestral ties of the Jewish and Palestinian people (both tracing their lineage back to Abraham) and it can also represent the Bible-based claims some Jews make to West Bank land. While I carve, I continue to contemplate peace. Thanks to everyone who joined the conversation in the last post about peace and not eating meat. I found a lot to think about there and I'll probably circle back around to that topic again. Being an artist, and especially working with a method that could be called "slow art," I do have a lot of time to contemplate. And being a blogger, I receive input from other people that helps my contemplation develop. My blogger/printmaker friend Katka (her relief printing blog is The Blue Chisel) left a comment last month recommending an author named Maxine Kaufman-Lacusta. 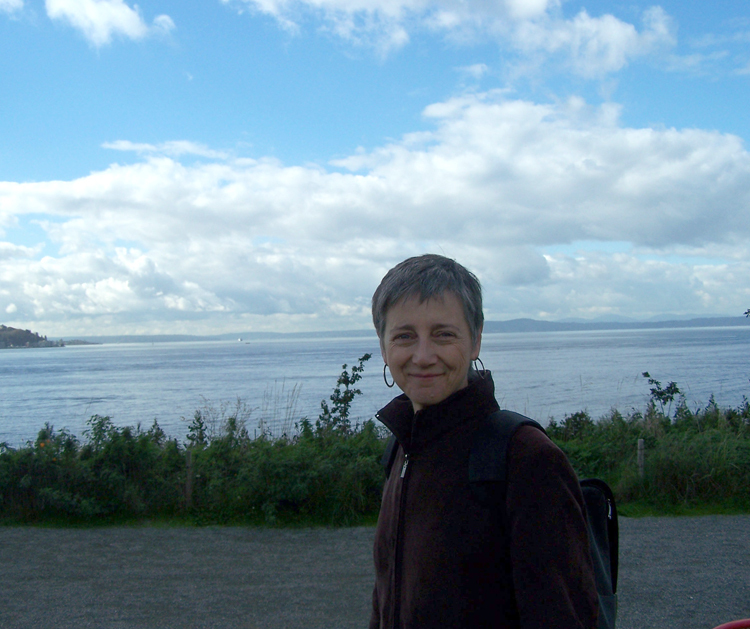 I Googled her and discovered that Kaufman-Lacusta is a peace activist who has written a book called Refusing to Be Enemies: Palestinian and Israeli Nonviolent Resistance to the Israeli Occupation. The book looks excellent, but it doesn't exist in audio form and I can't read while I carve and print, so I didn't buy it. But I've gotten a lot of mileage out of simply contemplating the title: Refusing to Be Enemies. Thinking about it, I realized that I've been on the receiving end of someone's refusal to be enemies, and I can attest that it is an utterly disarming tactic. It happened almost 20 years ago when I first started dating my partner Lynn. Between us, Lynn has the sunnier disposition while I can be a little pessimistic and prone to outbursts. One day I was especially irritable and I was trying to pick a fight with her. I kept saying argumentative things and Lynn kept deflecting my comments, letting it all roll off her like water. Finally she simply said "I'm not going to fight with you." So there I was, all wound up with nobody but myself to fight with. The fire that I had been trying to ignite quickly sputtered out. Not that it's easy to refuse to be enemies. When someone wrongs you, the easiest thing in the world is to become indignant. Righteous anger can be pretty exhilarating. If the confrontation is over more than a trivial matter it can take tremendous effort to restrain oneself. But it can be done. Maybe peace isn't the absence of conflict. Maybe peace is a decision to stop fighting. Or even a decision to stop struggling against fighting. Lynn could have fought with me about fighting, but she didn't even engage with me at that level. She just refused to allow me to turn her into my enemy. We have that power. Anybody who blogs will be familiar with the phenomenon called "comment spam." Comment spam comes in several varieties. Some are anonymous comments full of links that blatantly advertise other web sites that have nothing at all to do with your blog. Other comment spam is actually relevant to the content of your blog, but advertises its own agenda. Usually this type of spam is done by using an alert program that hunts for relevant keywords and then places the spam into conversations about those words. Aren't humans amazing? They kill wildlife - birds, deer, all kinds of cats, coyotes, beavers, groundhogs, mice and foxes by the million in order to protect their domestic animals and their feed. Then they kill domestic animals by the billion and eat them. This in turn kills people by the million, because eating all those animals leads to degenerative - and fatal - health conditions like heart disease, stroke, kidney disease, and cancer. So then humans spend billions of dollars torturing and killing millions more animals to look for cures for these diseases. Elsewhere, millions of other human beings are being killed by hunger and malnutrition because food they could eat is being used to fatten domestic animals. Meanwhile, few people recognize the absurdity of humans, who kill so easily and violently, and once a year send out cards praying for "Peace on Earth." First of all, let me state right up front that I'm repulsed by factory farming of animals. My own meat consumption has gone from daily when I was a child to about 2ce monthly just from contemplating the unpleasant notion of eating the carcass of a frightened cow. I also agree with the sentiment that humans are amazing. And I agree with the implied message that human logic is often ridiculous and flawed or simply absent. What I don't like in this neatly packaged paragraph is the idea, also implied, that if we were all to stop eating meat there would somehow be peace on earth. To me this is a wishful oversimplification, not unlike "cut taxes and government spending" as the solution to all our economic problems or "just say no" as a method of stopping drug traffic. If things were that simple we'd be done with them. As I discovered in my research for the Pilgrim series, the practice of keeping domestic animals is quite ancient and it came to North America with the colonial settlers. The practice of eating animals goes back forever as far as I can tell. So does the practice of making war. I don't know if it's possible for us to entirely stop doing either one. The question we seem to be facing right now, in almost all areas of our living, is how/whether we can keep doing our human things at a global scale. How long can we continue to make war before our weapons wipe out the planet? How long can we keep privatizing goods and resources before we've sold our children's futures? How long can we keep consuming cheap goods before we run out of cheap labor and fuels and we have to pay what things are really worth? Our food cycle certainly falls into these categories too -- industrial farming of both plants and animals is unsafe and unsustainable. Getting back to the topic of my current print, I'm pretty sure that adopting a vegan lifestyle will do little to solve the Israeli/Palestinian conflict. But what would peace there look like? I believe that both the Palestinians and the Israelis want peace, but they disagree about what a peaceful Israel/Palestine would look like. What would peace on earth look like? Is it possible? Thanks for the topic, mr. spammer! Here's the Israel Separation Barrier print in progress, after 9 applications of color. The tan areas are Palestinian territories, the blue areas are Israeli territories/settlements, and the density of the color indicates population densities. As I've been working on this print I've been thinking a lot about peace. Lynn and I had a 7-hour drive over the Thanksgiving holiday that gave us lots of time to talk, and when she asked me how the print was coming along I heard myself tell her "I think I'm a pacifist." Sort of a dorky thing to say, but I appreciated it when Lynn then asked me, "but what does that mean? What's a pacifist?" Since then I've been trying to articulate to myself what I really believe about peace -- whether I think it's humanly possible for there to ever be peace on earth, whether I even believe it's possible to be truly peaceful in my individual dealings. So while I continue to procrastinate on fixing my baren, I'm also reading about peace. It's a good season to study peace, I think. My plan for this Israel/Palestine print is to describe the situation using Old Testament Bible stories. Since the print is about a wall (Israel's separation wall), the story of Joshua and the Wall of Jericho came to mind. I have to admit that I hope a loud shout and a blast on the trumpets will bring down Israel's separation wall someday. There's another wall of great importance in Israel which I won't be showing in this print but which I'll mention, namely the Western Wall, or Wailing Wall. Located in Jerusalem at the foot of the western side of the Temple Mount, this wall is a remnant of the wall that surrounded the ancient temple's courtyard. It's one of the most sacred sites in Judaism and also a source of strife between Muslims and Jews, as Muslims worry that the wall is being used to further Jewish nationalistic claims to Jerusalem and the Temple Mount, which Muslims also claim. Israel seems to have a long history of wall issues. For five years I've managed to wriggle out of this task by getting other people to do it for me, but it's finally time for me to learn to tie a baren cover. I won't be a real moku hanga-ka until I've done it, so wish me luck. This Israel/Palestine print I'm working on is the first large print I've done in my new house. The paper size is 19 x 26 inches (a half sheet of washi) and the studio in my new house is smaller than my last space, so I decided I needed some extra surface area to print these comfortably. Found the little 4-foot folding table above at Staples to do the job. I like it because I can set it up when I need it, but it's easy to fold and store behind the door. Sometimes I carve all or most of the blocks at once and then do all of the printing at once, but sometimes I work back and forth more between carving and printing. In this case I'll be doing some reduction work on some of these blocks, so that means carving, printing, carving some more and printing some more, all on the same blocks. 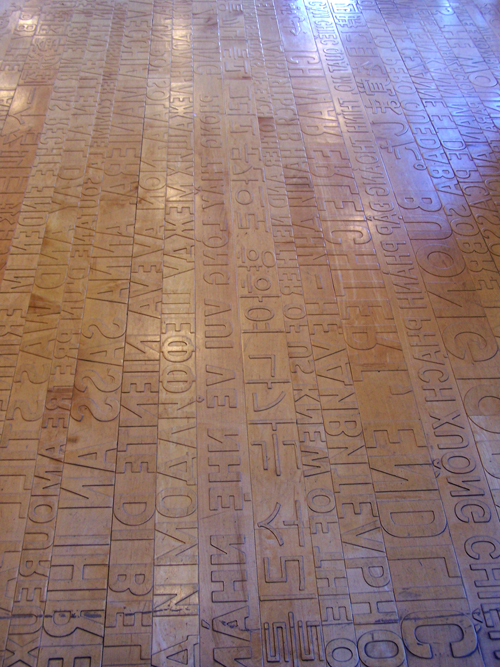 I began by carving two blocks that are basically opposites of each other, like jigsaw puzzle pieces. You can see clearly the white outlines of some of the "characters" I'll be adding to the print in the future. I'll tell you about them later, as they appear on the "stage." On top of these two colors I added a layer of gray just to tone it down. I took a photo, but you can't really see the difference that the gray makes in my not-very-consistent photographs. Trust me, though, an overprinting of gray helps blend and tone down colors. My next step is to carve each of these blocks a little more. Rather than land features, I'll be showing something more like population densities in each of these areas. But I doubt that I'll make much progress before the Thanksgiving holiday, so see you next week. Safe travels. Israel and Palestine. Oh, where to begin. As with all of the prints in this series about fences and walls, I begin with the land. I wanted to find a spot along the Separation Fence that would tell the story in a nutshell, so first I went to Google maps to see if the fence is visible in satellite photos. You bet it is! This week I carved a couple of blocks just to define these two areas that are separated by the wall and I started printing yesterday. I'll fill you in on that process next week. Back to some reporting on my visit to NY Print Week. This year marked the first "Fine Print and Drawing Fair at Lighthouse International," an event that I had some trouble finding out about. I was first tipped off by a mention from a friend, but when I googled "Lighthouse print fair" the actual web site for the event didn't come up until page three. (The SEO problems seem to be partly because the event doesn't have its own URL and partly because the information is a jpeg of the announcement rather than html code that would allow search engines to pick up the words.) This fair is apparently a breakaway from the IFPDA group, as you can read here on the Annex Galleries web site. At any rate, it's too bad that the publicity was less than stellar, because the fair had some fine exhibitors. First was my all-time favorite exhibitor, Davidson Galleries of Seattle. It was nice to see an etching by Hibiki Miyazaki (right), whose work I know only from online. I spent a long time at the Annex Galleries' booth poring over their huge collection of color woodcuts spanning many years and many artists. I was amazed to see (and have the opportunity to touch!) some very rare prints by Gustave Baumann. 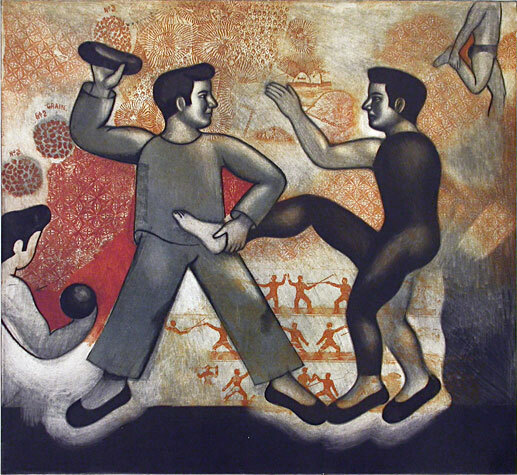 I also appreciated being introduced to the woodcuts of Sylvia Solochek Walters (below). Walters was chair of the art department at San Francisco State University for many years and now serves on the Board of the Kala Art Institute in Berkeley CA. Unfortunately, by the time I finished perusing the Annex Galleries it was already way past lunch time and I still had the entire IFPDA Armory show to see so I gave short shrift to the rest of the Lighthouse Fair. Please leave a comment if you went to Print Week and let me know if you made it to Lighthouse. I'm curious to hear what others thought. The past two days of my studio time have been devoted to preparing for "Print Fair North," the annual open studio sale at Zea Mays Printmaking in Florence, Massachusetts (just outside of Northampton). There will be hundreds of prints by over 30 artists in all price ranges. I've prepared about 50 prints for the sale, most from editions but also some experimental one-of-a-kind prints and proofs. I'll also have copies of the We Are Pilgrims book for sale. If you come to western Mass. for Print Fair North, be prepared to make a day of it. The building where Zea Mays is located, the Arts and Industry Building, houses over 100 artist's studios and small businesses and has a regional reputation as the workspace of some of the area's most creative people. 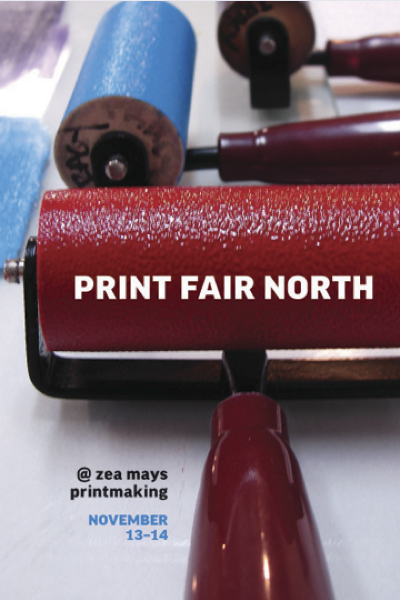 Print Fair North coincides with the Arts and Industry Building's giant Open Studios event. It's a chance to visit dozens of artist's studios in the building as well as this fantastic print fair. Hope to see you there! I'm back from my whirlwind 14-hour trip to New York to see this year's Print Week offerings, or at least as many as I could cram into that short amount of time. This year there was a new fair, the "Lighthouse" Fine Print and Drawing Fair, in addition to the EAB (Editions/Artist's Books) Fair and the venerable (20 years!) IFPDA Print Fair at the Armory. Each of the fairs had its own personality and emphasis, which made for an interesting day. I'll look at each fair in its own post over the next few days. My first stop was the EAB (Editions/Artist's Books) Fair in Chelsea. Of the three print fairs, this one is the broadest. It's kind of a hybrid event featuring artist's books, two-dimensional prints and works on paper, three-dimensional multiples, small installations, and even some video. It's definitely the most contemporary and hip of the three fairs and the most accessible with its free admission. Here are a few exhibitors that were highlights for me. I was happy to see Center for Contemporary Printmaking from Connecticut. CCP, the self-described "only nonprofit organization between New York City and Boston solely dedicated to the art of the print," is located fairly close to where I live, but shamefully I've not made it there yet for a visit. I was excited to see that CCP was showing Mike Lyon's moku hanga print "Grass 2.2" (shown above). Mike has been a virtual friend on various printmaking web sites for several years but I've never seen his work in real life so it was a treat. I was surprised when the CCP representative who I spoke with didn't know that Mike cuts his large blocks with a computer-controlled router. That fact, to me, is one of the most interesting aspects of Mike's work -- he designed, built and programmed the carving router and also designed and built a very large-bed press with a special system to deliver the large sheets dampened paper to the bed. This equipment is quite amazing in its own right. 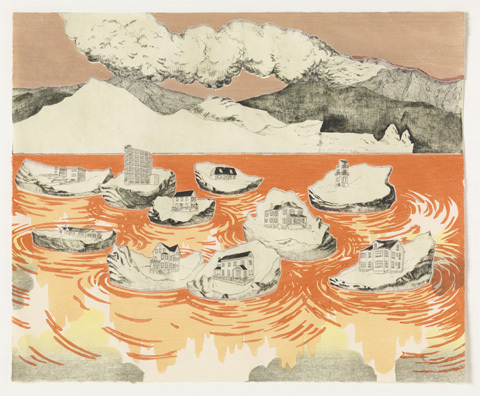 I've been interested in the artist Jiha Moon ever since I had the opportunity to watch her work with master printer Peter Pettingill at Smith College a couple of years ago, so when I saw a piece that looked like her work at the Landfall Press booth I had to stop and investigate. The recently completed print, shown at right, is more understated than some of Moon's other work and I really like it. The white pieces of paper you see at the top are fortune cookie fortunes. I'm not sure if this is an etching or a lithograph. Anyone know? Unlike some exhibitors at the other fairs, representatives at the EAB Fair seemed willing and in fact eager to talk with just about everyone who was passing through. I had a nice conversation with a man who was selling Esopus magazine. Esopus is an arts magazine published twice a year that features fresh work from a wide range of creatives, themed for each issue. A sampling of fiction, poetry, visual essays, interviews, etc. can be found in each issue, plus a themed CD of new music. I bought a subscription! I also enjoyed some time at the Cade Tompkins Editions booth. 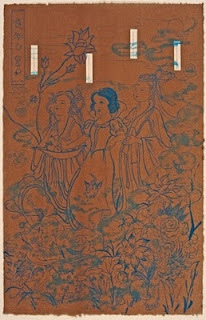 Cade Tompkins is an art dealer who also represents RISD Editions, the Rhode Island School of Design's visiting artist’s program in the Printmaking Department. At the booth I saw work by Daniel Heyman as well as Serena Perrone's wonderful etching plus moku hanga piece shown above, printed by Ningyo Editions. 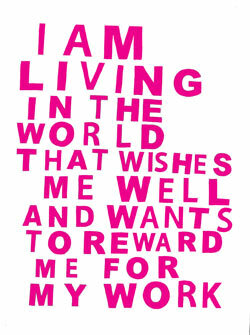 I want to note one other work, a screenprint by Graham Gillmore. The Dorfman Projects booth displayed four or five different versions of this piece, each with a different hand-painted background, and there was something quite heart-wrenching about the sentiment expressed. If you're an artist, you can't read these words without irony, yet you also know that these same words are held deep in an artist's heart where they ring with complete earnestness. I found myself deeply touched by that dichotomy. Next I'll blog about the new "Lighthouse" Fair. 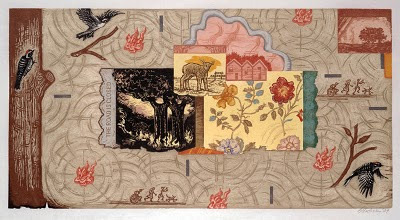 In 2008 I started a series of prints about fences and walls -- places, usually at international borders, where people have built structures designed to keep other people out. I started with the border fence being constructed at the U.S. / Mexico border and then I went on to complete a print about the Great Wall in China (both shown below). The next print I had planned for the series was the separation barrier between Israel and Palestine, but I began to feel afraid of tackling such a huge and volatile topic. So I decided that I needed to stick closer to home, to work with material that I know in my bones and that I feel "qualified" to critique. I spent the next 2 years making the 15 Pilgrim prints. Now I feel ready to tackle Israel/Palestine. But first some caveats. It may sound silly to say this, but I want to be clear that a single print can not no how no way even begin to encompass the complexity and the magnitude of the Arab/Israeli conflict. I am a non-Jew, a 21st century American gentile woman with only a passing understanding of the complex history of the Jewish people. There's a lot I don't know. What I do know is this. I know the Bible from a childhood spent reading it. I know the history of World War II mostly through my father, who fought for 3 years in Europe. And I know my American Jewish friends, some of whom call themselves Zionist but most of whom do not. Most of all I know my own heart. 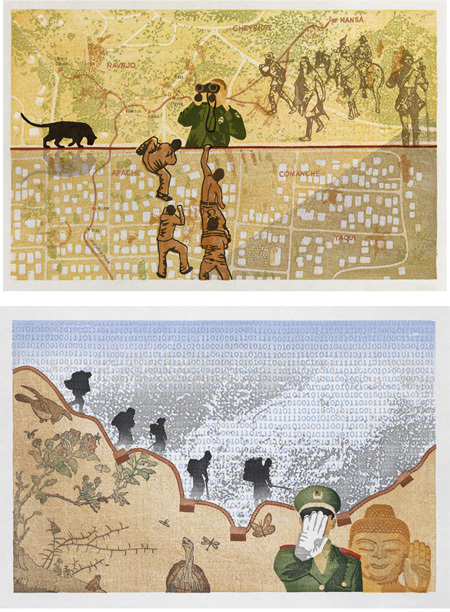 So this print will reflect me and my heart's feelings about Israel's separation barrier. I am an artist, not a reporter and not a historian. But this print can't be made without working with historical material. There is probably no area in the world with a deeper history than the area we now call Israel/Palestine. It has been settled continuously for tens of thousands of years, archeologists have found remains of very early human and Neanderthal creatures, and it is one of the oldest sites of agricultural activity in the world. May my print honor both the sacredness of this land and the tragedy of this conflict. The IFPDA Print Fair, which happens every November in NY City at the Park Avenue Armory, has become one of my favorite annual events. 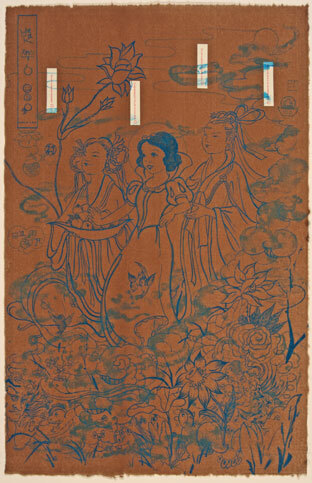 From Utamaro to Rembrandt to Chris Ofili, there are prints of all kinds on display from over 80 exhibitors. Lucky for me, Smith College Museum of Art sends a bus down every year so I don't even have to drive. The Armory Print Fair is a total printmakers' feast and could easily take up the entire day, but concurrently there's also the Editions/Artists' Books Fair at 548 W. 22nd St. in Chelsea. It's too much to see in one day, but I always try. Needless to say, I sleep on the bus ride home. The Fair opens with a VIP preview on Wednesday, November 3rd from 6:30-9:00 and then continues through Sunday the 7th. I'll be there on Saturday and I hope I'll run into you! It's well worth the trip if you can make it. And I'll post some photos afterward. 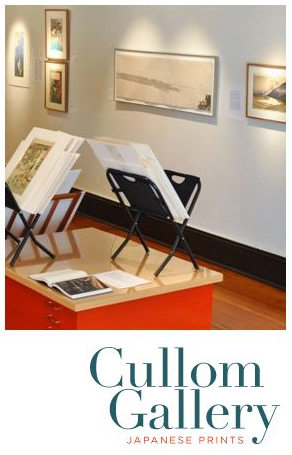 Wanted to let you know that you can visit the Cullom Gallery blog to see some more photos from the "We Are Pilgrims" opening and the demo the next day. It was great to meet some new people as well as some folks I've known for several years but only online. I got to meet Viza Arlington, who has been making some great white line woodcuts, and Brian Lane, the Seattle half of the famous Print Zero duo. Thanks for coming out, everyone! The show is up through November 27 if you're heading to Seattle for the Thanksgiving holiday. Lynn and I were very remiss in our picture-taking while we were in Seattle for the "We Are Pilgrims" opening, but gallery director Beth Cullom took a lot of pictures (and she has a really nice camera) so I'll let you know once she's posted hers. Meanwhile, here are a few teasers. This was the first time I ever had my name up on the wall in vinyl. 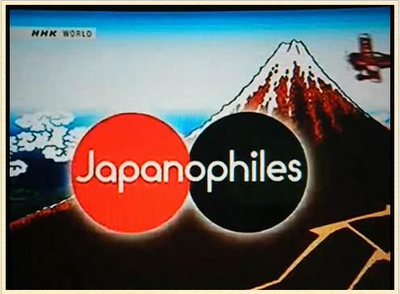 A nice Helvetica-like font. The work looked great, well lit and dressed in simple wood frames. By the end of the night there were quite a few red dots! Thanks, Beth, for a really nice opening. I first encountered moku hanga in 2005 through a three-day workshop with New Hampshire printmaker Matt Brown, a workshop that was life-changing for me. However, I actually owe an even larger amount of my knowledge about moku hanga to a woodblock printmaker I've never met, Japan-based Canadian printmaker David Bull. 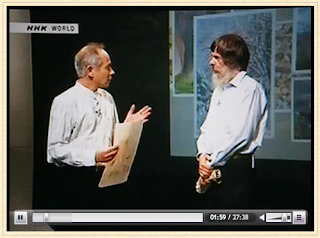 NHK, Japan's public television network, has just produced a 30-minute segment about the life and work of this accomplished printmaker, so I thought I would take advantage of the occasion to write about David on my blog. David's 30-year love affair with this artistic medium has literally been the scaffolding upon which my own learning has taken place. How is that possible? First of all, the computer makes it possible. In 1997, David launched the Baren Forum listserv and accompanying web site. The Forum began as a way for isolated woodblock artists and craftsmen around the world to compare notes, learn from each other, and talk shop. In the 13 years since it began, the site has become the go-to place on the internet for English-speaking Japanese woodblock artists, an absolute treasure-trove of information for anyone who is interested in exploring the medium outside of Japan. Although David handed over the reins of the Baren Forum site to a team of volunteer administrators several years ago, the site would not exist and would not be so comprehensive without his influence and expertise. I've learned 90% of what I know about woodblock printing through trial-and-error combined with strategic searching and question-asking on the Baren Forum web site. In addition to technology, the other ingredient that makes my relationship with this printmaker on the other side of the world possible is David's own infectious enthusiasm. 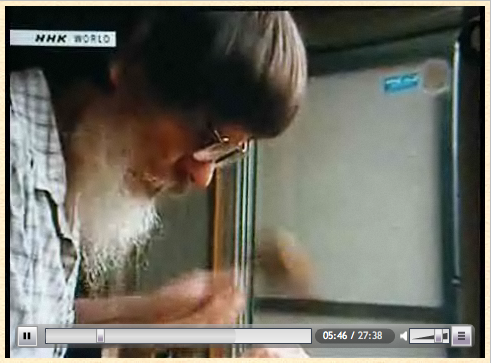 Notice it when you watch the video above -- David Bull loves Japanese woodblock and he has a deep desire to preserve this ancient craft in the midst of a rapid decline in trained printers and carvers and the accompanying decline in suppliers of wood, washi and tools. I believe it's this enthusiasm that gives David the energy to reach out over and over again to other printmakers around the world to share what he knows. Whether by facilitating contact between western artists and Japanese suppliers via the Baren Mall, where one can buy supplies directly from Japan, or producing an e-book called Your First Print, a "highly practical and focussed guidebook that will take you - step by step - completely through the process of creating your first print," David conducts all these activities on top of the hours and hours he spends producing his own superb and finely crafted work. In many ways David is a bridge between this exquisite but declining Japanese art form and artists in the West who are deeply interested in learning it. Congratulations to David on this wonderful NHK portrait of his life and work. Perhaps one day we'll meet in person. The Pilgrims have made a long journey westward, and I'll soon follow them! I hope that all of you blog readers in the Pacific Northwest will join me at Cullom Gallery in Seattle on Friday, October 15, 6-8 pm, for the party celebrating the opening of my We Are Pilgrims exhibit. I'll also be doing a printing demo and talking about the making of the Pilgrim prints on Saturday, October 16 starting at 1:00 pm. 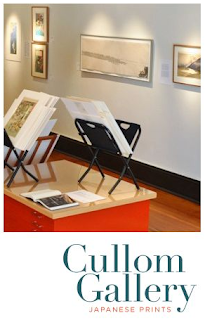 I'm really excited to be returning to the wonderful city of Seattle and I can't wait to see Cullom Gallery's new digs. Hope to see you there! Today I found a web site that offers audio clips of scholars actually speaking some of the Babylonian and Assyrian texts from clay tablets that have survived over these many years. Babylonian and Assyrian belong to the Semitic family of languages, and are generally thought of as two dialects of a single language ('Akkadian') rather than as two separate languages. Check out some of the sound files here. Language is an amazing thing. It carries so much of a culture and a people. Hearing an extinct language like this spoken aloud is like seeing light from a star that exploded a gajillion years ago. It's magical. Speaking of extinct languages, I heard yesterday that linguist Jessie Little Doe Baird of Mashpee, MA, founder of the Wampanoag Language Reclamation Project, received a MacArthur Genius Grant to continue her work. Here is my previous post about Baird and her project and John Eliot's Bible. Back in January of this year I completed a print called Ten Little Nine Little Indians that addressed the small pox plague that wiped out an estimated 90% of the native population of New England in the early 17th century. The print features a large red representation of the small pox virus in the center. 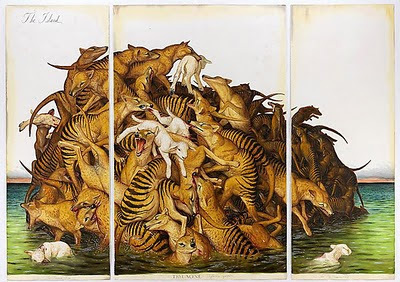 A few weeks ago artist Andrea Pratt, who blogs at Coloring Outside the Lines, left a comment alerting me to the work of Canadian artist Ruth Cuthand. I did some Googling and sure enough I found another kindred artist working with some of the same material I've been mining. A Plains Cree (the largest group of First Nations in Canada) and Scots/Irish artist, Cuthand initially studied printmaking, but due to chemical sensitivities she turned to painting and multimedia. 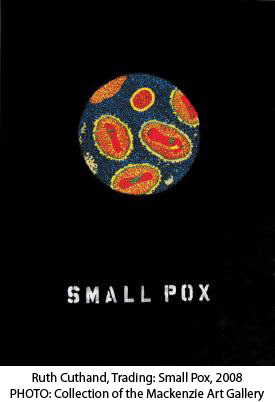 The image shown here is from Cuthand's recent "Trading Series" in which the artist uses finely crafted bead work to render microscopic views of the viruses that were brought to North America by colonization. In a review of "Trading Series" by Patricia Dawn Robertson, Cuthand is quoted as saying, “I did an Internet search for the viruses, and they were just gorgeous to look at." I resonated with this observation and it made me think about the delicate line I often find myself attempting to walk when depicting harsh and difficult topics. It's easy to bash a viewer between the eyes with violent or shocking images, but I think that work which does so ends up appealing only to those who agree with the point of view. I think it's much more profound and powerful to find the beauty even in the horrific, to draw a viewer in with beauty and care and thoughtfulness and invite a more subtle exchange between the work and the viewer to occur. This is a difficult thing to achieve, but Ruth Cuthand has done it with this series. The full quandry of colonization is expressed here so simply: European trade brought new items that revolutionized Aboriginal life (like glass beads), yet was the cause of the decimation of many native peoples . You can click this link to read more about Cuthand and see videos of her speaking about her work. A New Web Site. Again. Last Friday, after about a week and a half of work, I put the finishing touches on a new web site. The whole process made me think about the history of my site and how much things have changed since I first launched anniebissett.com. It had rollovers in each of the four corners that would take you to four different areas of the site, and images would appear in the center white area. I designed it, but since there was no drag-and-drop type web software at the time, I paid about $2,000 to have a local tech company called Gravity Switch code it for me. I used that site for a number of years. Nothing fancy, but I could add sections as I needed them and image sizes were flexible. I used this site until sometime in 2008, when I noticed that a lot of fine artists were using template hosting sites like Foliosnap, ArtCat, and Other People's Pixels. The sites all looked good and professional, and the idea of not having to mess around with Dreamweaver was very attractive to me. It's pretty elegant and simple. I liked Foliosnap a lot. The interface is easy to use, you can customize it quite a bit, and it's non-flash. I would still be using it, but I ran into a limitation once I published the "We are Pilgrims" book. The Foliosnap template wouldn't allow me to put any HTML links in the image descriptions, so I couldn't have a page for the book that would link to the Blurb site to purchase it. That was a deal breaker for me, so I looked around for an alternative. I settled on Other People's Pixels (OPP), which is cheaper than Foliosnap and almost as easy to use. OPP also allows for more text on each page and, since I'm a little long-winded, that works great for me. Here's the front page of the new site, and here's a link to it. We'll see how long this one lasts! This weekend I took a drive through the pumpkin patches and apple orchards of Hatfield and Whately to Sunderland MA to see Mike's Maze at Warner Farm. Designed and cut by artist William Sillin, these huge cornfield mazes have been an annual tradition at Warner Farm since 2000. I was excited to hear that this year's maze was an homage to Andy Warhol the printmaker! Here's the view from inside the maze. Fortunately, you get a map to help you get around. In this maze, there are 16 "printing stations" which, if you find them all, allow you to make CMYK reproductions of four famous paintings. Each station consists of a wooden platform with a lid that holds a rubber stamp and an ink pad, plus a sign indicating the correct orientation for your printing paper. Then close the lid and push down to print.